According to Pep Guardiola, if Manchester City are to win the quadruple this season, they need to play the rest of their matches like a machine. Forget the potentially historic consequences, put aside emotion, eschew fear, just do what is required. In short: don’t over-think. 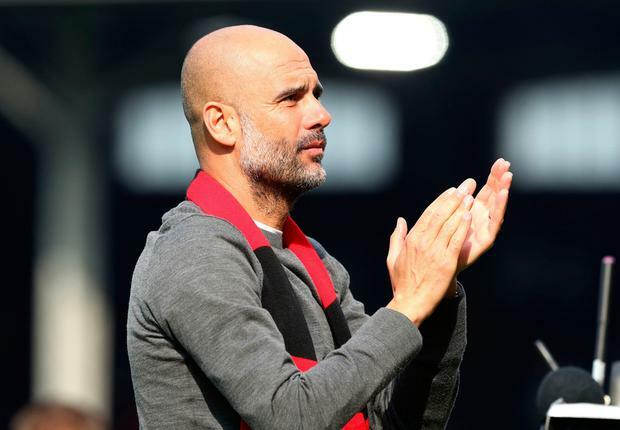 “We are trying to achieve something that is very difficult to achieve,” said Guardiola after another three points had been safely banked with a 2-0 victory at Craven Cottage. “At the beginning of April, we have won two titles this season (Community Shield and League Cup) and we are fighting for the other three (Premier League, Champions League and FA Cup). “The way we start to play (today) they (the players) show me they want to try. It is so difficult but they want to try. Returning from an international break for the fourth time this season with a league victory (and a clean sheet), City’s players demonstrated they are following their manager’s instruction: they do not look a bunch likely to be distracted by the enormity of the task. More to the point, as the season reaches its business end, Guardiola is blessed by having an almost entirely fit squad at his disposal. Against Fulham, his bench – featuring John Stones, Leroy Sane, Gabriel Jesus and Riyad Mahrez – was almost comically strong. And thanks to the most accommodating of hosts, Fernandinho and Kevin de Bruyne were able to ease themselves back into contention after lengthy absences without hint of physical interference. No wonder Guardiola is relishing the rapid-fire nature of his forthcoming fixture list and the manner in which its intensity is keeping his players on their toes. But if competition is something he welcomes, there was precious little of it at Fulham on Saturday. City faced a team who failed to score, win a corner or have a shot on target; it is hard to recall whether any of their players managed to make a successful tackle. The visitors started at full pelt, but once Bernardo Silva and Sergio Aguero had put them in an unassailable lead after 27 minutes, they eased up to the point of practically taking the rest of the afternoon off. Poor Scott Parker, the Fulham caretaker manager who is surely destined now to take his team into the Championship, could only watch with admiration as his side were toyed with. Frankly, for much of this game Fulham looked as if they would have been powerless against their local park team. That the biggest cheer from the home fans came when City’s Nicolas Otamendi managed the unlikely feat of putting the ball over the roof of the Putney End stand when shooting from 20 yards was indicative. Fulham appear to be going down not so much with a fight as an embarrassed shrug of the shoulders. City, on the other hand, are mainlining confidence. So much so that their players are now avoiding false modesty and openly talking about the possibility of the quadruple. “I feel I want to win and win and win and go again,” said Ilkay Gundogan.